I am finally back working again after the birth of my son, and I've polished off 3 murals in the last 3 1/2 weeks, with one of them being a collaboraion with my friend Adam Turman. If you want to keep up to date on all of my other projects, sign up for my newsletter right HERE. Now, to celebrate the birth of my son, I am having a sale on Friday, March 25th. 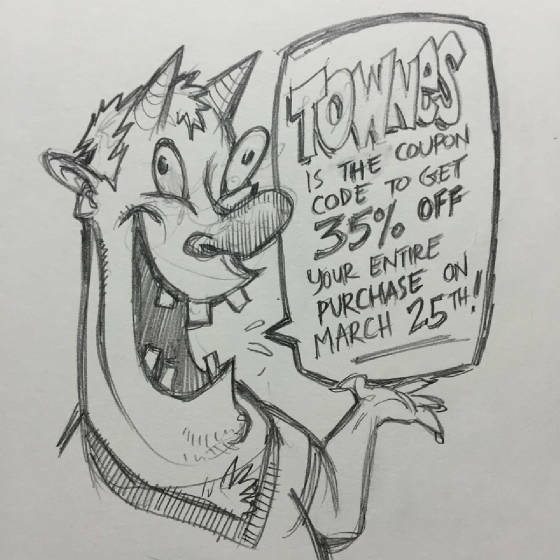 Use the coupon code TOWNES to get 35% off your entire purchase in either my Etsy shop or the DWITT Market. This sale covers everything that is available: prints, posters, test prints, original art from The Growler, original paintings, comics, books, and stickers! This is sale is one day only! Enjoy!